Performers include the ABBAFAB tribute band, country/folk singer-songwriter Ann-Marita Garsed and folk/Americana singer-songwriter Grim Bernhoft. (THOUSAND OAKS, Calif. – March 18, 2019)The largest Nordic festival in Southern California will return to California Lutheran University in Thousand Oaks on April 6 and 7. 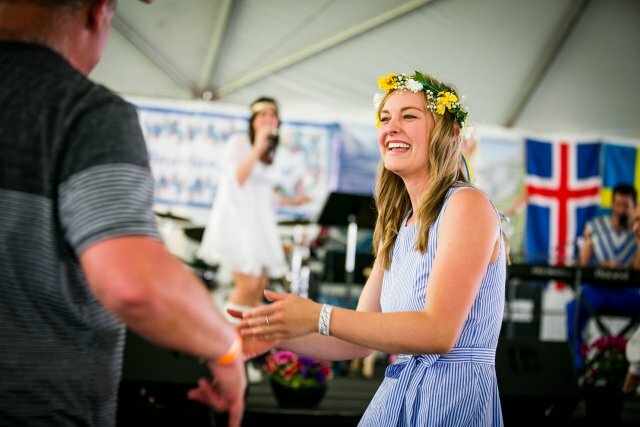 The 44th Scandinavian Festival will celebrate the cultures of Denmark, Finland, Iceland, Norway, Sweden and the Sami people from the Arctic regions of Scandinavia. The festival will run from 10 a.m. to 5 p.m. with music, dancing, food, crafts, presentations, demonstrations, vendors and activities for people of all ages. An ancient Viking kubb tournament has been added to the festival this year. A lesson will be held from 10 a.m. to noon April 6 and the tournament will follow from 1 to 4 p.m. People can sign up online before the festival. As in years past, the festival will feature a Children’s Stage with a puppet show of Hans Christian Andersen stories and a performance of “Three Billy Goats Gruff.” Children can visit each Scandinavian country’s craft booth, receive a sticker on a passport and earn a reward for collecting all of them. Near the maypole, guests can make their own souvenirs by decorating head wreaths with flowers and ribbon. Festivalgoers can also wander through an authentic Viking village, as well as a Sami sliddastallan, or community gathering. For dog lovers, the Norwegian Elkhounds will be on hand, and to have a truly personal experience, one can ask the rune reader for advice. Guests can enjoy a collection of Scandinavian vintage cars and motorcycles on display Saturday and try Dala horse croquet both days. Scandinavian food is always a highlight of the festival. Swedish pancakes, Viking dogs, Swedish meatballs and other favorites will be available in the food court. Festival foodies not only can taste, but also learn how to make aebelskivers, lefse and krumkake at food demonstrations. Performers include acclaimed storytellers Robert Seutter (aka True Thomas), the musician and entertainer Ross Sutter, the ABBAFAB tribute band, country/folk singer-songwriter Ann-Marita Garsed, folk/Americana singer-songwriter Grim Bernhoft, and Scandia and Swedish folkdance groups. Back by popular demand, experts from the Conejo Valley and Ventura County genealogical societies will share their knowledge and resources. Admission is $10 for adults and $5 for teenagers. Children are free. Parking is free. The event is produced by the Scandinavian American Cultural & Historical Foundation with support from Cal Lutheran. For more information, visit scandinavianfest.org or the festival’s Facebook page or email mdeterra@callutheran.edu.